On June 13, past and future grant awardees gathered for the third Annual Regenerative Medicine Minnesota Idea Exchange and Celebration, held at the University of Minnesota. Regenerative Medicine Minnesota grant awardees presented their progress to date and the future direction of their research. In 2018, eleven Mayo Clinic investigators received awards in education, research, and biotechnology. View past blog posts on the Mayo Clinic Education and Biotechnology and Research grant awardees. In attendance were Rep. Tony Albright (R-Prior Lake) and Rep. Tim Mahoney (DFL-St. Paul), who authored the legislation to provide $4.35 million per year to fund the program. Andre Terzic, M.D., Ph.D., director for the Mayo Clinic Center for Regenerative Medicine, highlighted the advancements of the statewide collaboration led by the University of Minnesota and Mayo Clinic, now in its fourth year of operation. In 2014, the Minnesota State Legislature allocated support to fund research, education, patient care, and business development initiatives that improve or increase access to regenerative medicine throughout the state. 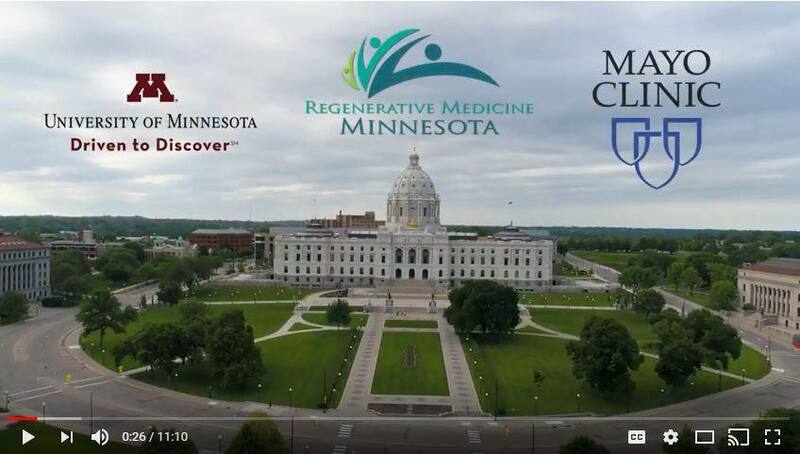 Regenerative Medicine Minnesota is focused on researching the regenerative medicine therapies of the future, creating the infrastructure and recruiting professionals to deliver these therapies, and bringing these therapies to patients across the state.